That quote there is the essence of all human interaction. Because truth might mean change? If truth will set you free; then what is the fear that keeps us from wanting to know the truth in order for us to be free. Is change a bad thing or a good thing? If accepting the truth means knowing what is reality; then the result of that should be humbleness. Is it our own pride that we fear losing if we accept the truth or are we just afraid of humility? Oh…The Truth! The Dreaded Truth! The truth taps into our ego, our spirituality, our humanity, everycore of our being. I dont think the truth sets “us” free, I think the truth sets our audience free. I’ve always said that you can lie to other people but you cant lie to yourself. So many of us look away from a situation, they pretend its not there and its not hapening but realistically it is. They MUST know its still there so they conciously choose to look away. Lieing to themselves out of their own fears. Such a natural instinct and a shame all in one. We, ourselves ignore our own truth. The best thing about living in the truth is you never have to remember anything specific! 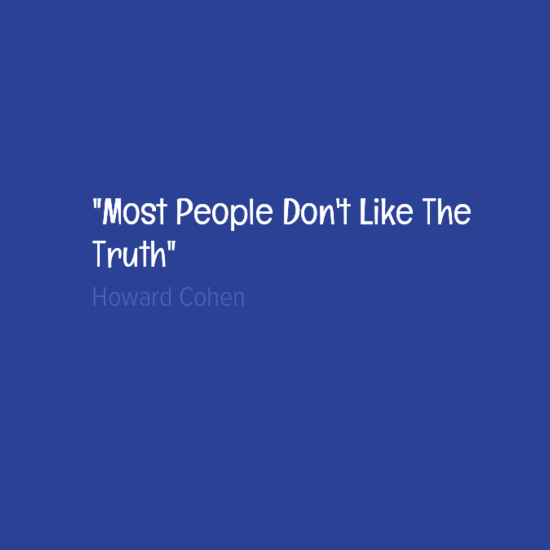 You just live… So “Most people dont like the truth” Is it your truth or mine? There is only one truth, it is the common denominator of life. Philosophy is definitly not my area of expertise although I think about things that are much greater than us more often than not. I think “truth” is and not limited to one big mathematical calculation! A scientific, tangible, and physical element of life. Something that has or can be proven. Maybe that expression “seeing is believing” is influencing my perception. I feel like air and possibly food/water is the common denominator of life. It stretches beyond human life…. Whats true in ones life isnt true in another (psychologically speaking). But what I do know is, people disconnect from the truth when its painful. Im not sure how this works in the business world, since people often compromise morals for money. Stacey, I do feel that you and I aren’t that far apart in your explanation: “I think about things that are much greater than us more often than not. When I was introduced to Quantum Physics about 10 years ago; I started to realize that everything is related; which then got me thinking about who designed this complex but simple universe. I say simple because the beauty of entanglement is that it has ebbs and flows internally and externally. The balance that keeps all of these relationships is where the Master Creator lives and if you believe as I do that the biggest truth of all is that G~D loves us all and wants His Love to surge through us and by that we become part of this universal relationship of life. So for me the foundation of all truth is if it leads us to Love. The opposite of this is if it leads to fear. Fear is what stops us from loving and also stops us from accepting G~D’s love for us. Peace be with you Stacey. What are you trying to tell me Mr. Cohen??? ?